During Sundays in winter or on rainy days in spring, the temptation to stay home, watch TV and eat Doritos until the sun comes out is real. Plans to clean, run errands or go outside and engage with other human beings are quickly pushed aside to sit and do nothing until it’s time to go to work on Monday. However, in an effort to be productive and stay motivated during this past particularly gross winter in Toronto, I knitted a lot with Bernat Alize Blanket-EZ Yarn. 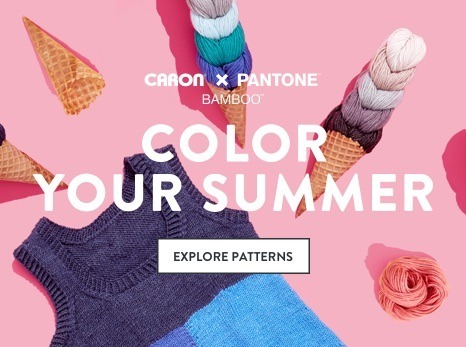 As a time-strapped Millennial who is generally crafty but not-so-talented at knitting or crocheting, playing around with Bernat Alize Blanket-EZ over the last couple of months has been eye-opening. After my friend gave me a five-minute tutorial, it took me about twenty minutes to get the basic looping down pat and within three hours I made my first scarf. 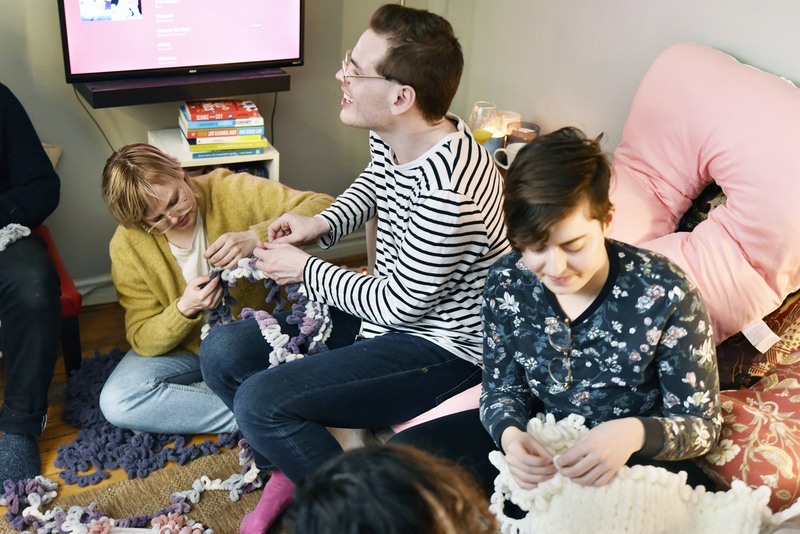 One February day while EZ knitting, I had an epiphany—instead of leaving my apartment to brace the elements, I could host an EZ circle and invite my crafty, hermit friends to make their own EZ projects! Once I got confirmation on how many people could attend, I had to figure out how to turn my mess of an apartment into an aesthetically pleasing experience. I knew I wanted to create a cozy, serene atmosphere for our Sunday Funday festivities so out came my sprinkle lights, essential oil diffuser and my best candles. For best results I recommend holding your EZ partyin a place where you have a lot of flat surfaces to work on. To accommodate everyone, I moved all my furniture to the sides of my cozy living room. For munchies I cooked (i.e. took out of the box and put in the oven) an assortment of frozen spring rolls and spanakopita, made some guacamole and salsa, laid out a sea of different chips and bought the best dollar store chocolates money can buy. Not a single green or healthy food item was served, just as Sundays were intended! The gaggle of nine eager EZ knitters that I met at my front door came with varying degrees of experience with yarn—some were pros at knitting and crocheting, but most came with ample ambition and little technical skill. Like a kindergarten teacher, I went one by one around my living room and showed my hyper class of newbie EZ knitters their first loops. 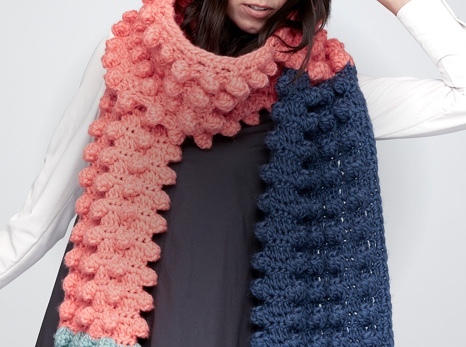 Connecting the first two rows can be a daunting task for non-knitters. Spread across every inch of my living room floor everyone began feeding their top loops through the bottom to form their foundation rows. Once everyone had the basic looping mastered and their foundation rows created, my rambunctious kindergarten class got very quiet as everyone started to conceive their new EZ masterpiece. Never one to stick to a pattern, Julia decided to go rogue and took all of the Thistle and Mauve balls and started to create what she referred to as an ”EZ Canopy” for my living room. While we didn’t finish it—it was a little too ambitious to create in just one afternoon—a giant purple canopy would look great hanging from my living room ceiling. I didn’t hear a peep from Joao for hours! He was totally engrossed in creating his own Criss-Cross Scarf with the Denim Blues shade; by the end of the day he had finished it and had a new scarf to wear on the way home! As an aside, I love seeing how Denim Blues loops together to create a beautiful mosaic of dark and light blues, with the white adding a wintry feel to the project. Camille was actually the person who first taught me to knit (over tea while listening to Enya, naturally). Camille had no problem learning how to EZ knit; using three of the white balls she completed a gorgeous EZ baby blanket over the course of the afternoon. Jonathan created what might be the first EZ beard, which he proceeded to stick on top of his existing beard. Wouldn’t EZ in Gray or White be great as part of a Gandalf or ZZ Top Halloween costume? Emma made a Garter Scarf in Burgundy. While initially intended for herself, in typical cat fashion her feline companion found it, stole it and the scarf has now become the cat’s new favorite blanket to hide under. Of all the shades we had for the party, I’ve been obsessed with the Mint shade. My office tends to be on the cooler side so I have a mini Afghan made of the Mint draped behind my chair. 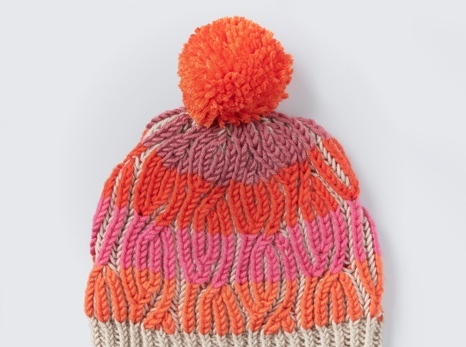 The EZ’s plush, pillow texture has been my lifeline during the freezing Canadian winter. 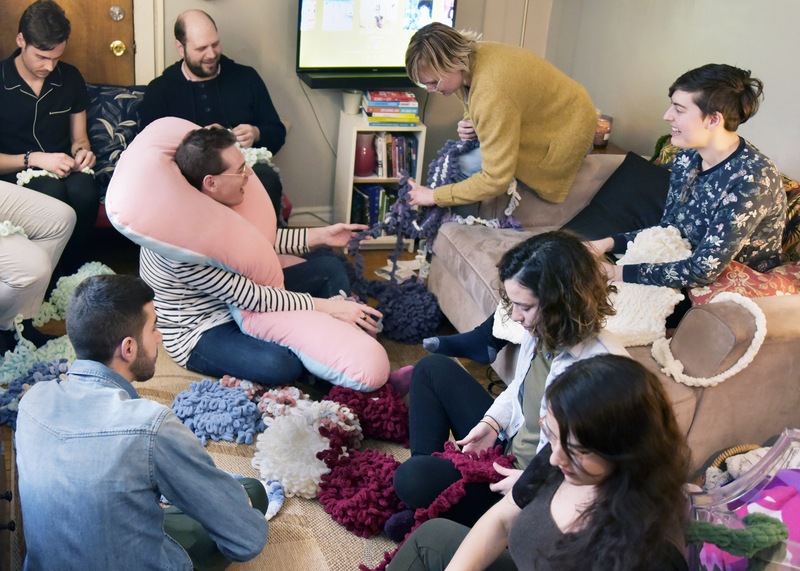 Over the course of five hours, everyone learned how to knit, caught up and enjoyed a couple of beverages and some snacks. Everyone left with their new EZ project in hand and went back to their respective caves to hide out until spring weather arrives. The wonderful thing about EZ knitting is that like most crafts it can be a communal experience. Everyone bands together to talk about their inspiration, help each other and catch up, and you can walk away with a new hobby. It was a great way to spend a laid-back Sunday Funday with friends and I will definitely be hosting more EZ parties again soon. Stay tuned! Cody is a Project Coordinator for the Marketing department at Spinrite Yarns. 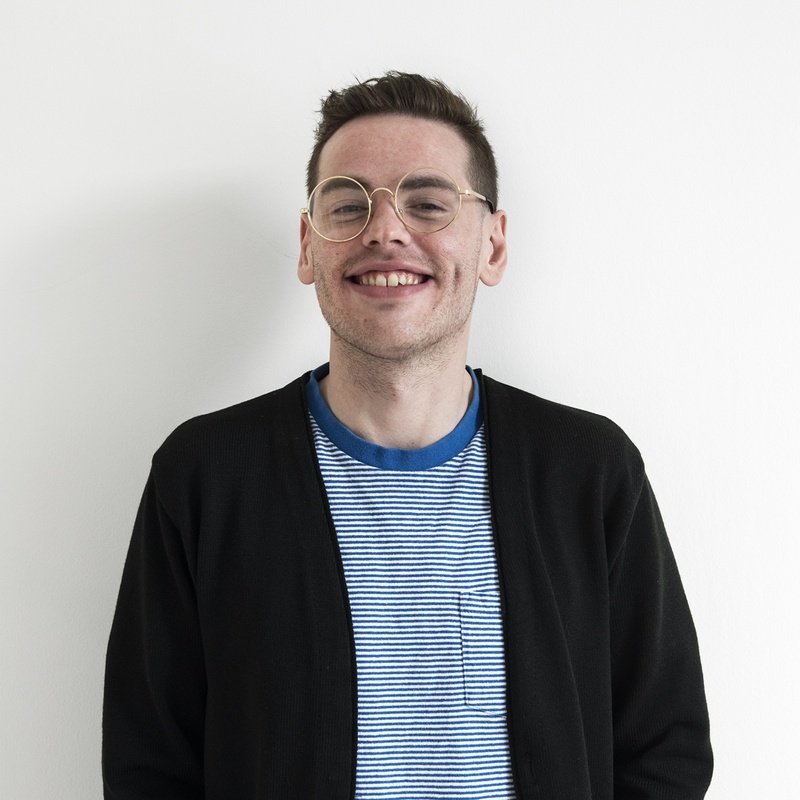 A novice crafter and knitter, Cody plans to continue to combine his love of yarn and hosting to throw more yarn parties and events in the future. 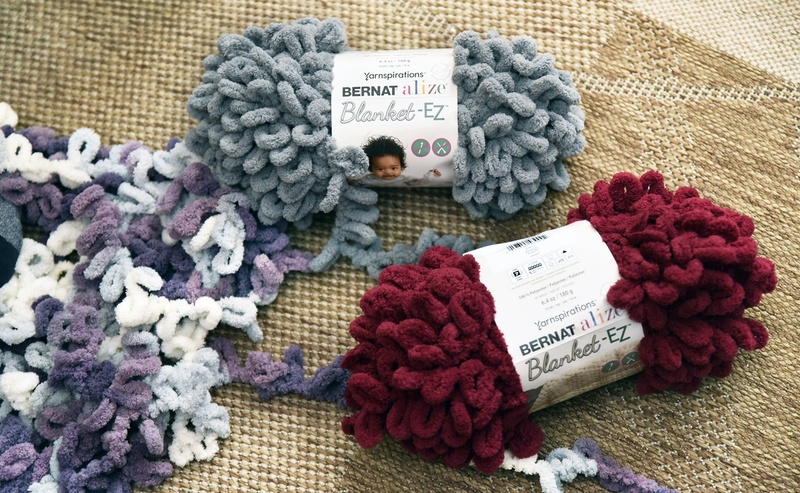 Get crafty with Bernat Alize Blanket-EZ! This new yarn features unique loops that help make your stitches, no needles or hooks required!